If you have any ambition to have a fulfilling career and aspirations to be an inspirational and impactful leader you need a strong, resilient and positive mindset. A mindset that supports you during the lows and helps you keep your head clear during the highs. I believe the work is pretty much never done when it comes to personal growth – which mindset is a part of – we have to keep at it. And don’t focus on a positive mindset the day before the job interview or the big meeting (yes, I’m looking at YOU, Carine), would you prep for a marathon by doing a couple of laps round the block the day before? of course not! Developing a positive mindset is the same. there is something almost childlike in curiosity (and I don’t mean nosey/Grazia-style curiosity) that brings a smile to your face and fills you with enthusiasm: “what will I discover today?”, isn’t it a much better way to kick off your day? really, NOTHING is permanent, yet we spend hours, £££, trying to make it so. Enjoy the blissful moments and accept the s*** ones. The upside is that you get to do it again, new opportunity, new choice. If you have a negative mindset you’ll see it as a curse, a leader sees that as a blessing. they are part of life (and are not permanent – see above). It may seem to you that you are the only one experiencing it but, trust me, that’s not the case. Use these challenges to build your resilience and, as a leader, take the learnings and move on. it’s much worse than the Bermuda one and far more common! See my article. Those endless and pointless meetings or conversations where blame is being dished out and where victim-persecutor-rescuer go round and round. As you can imagine it does your positive mindset no favour. As a leader take responsibility but refuse to play any of these roles. nurturing a positive mindset doesn’t mean sticking your head in the sand and pretending challenging situations or feelings don’t happen. It’s important you process your emotions, your reactions and actions as they are a great source of information and build your resilience. As a leader you want to get to the insight so you can make the necessary changes, and that is developing a strong, positive mindset. our language is so important as this is what our brain listens to all day long. To nurture a positive mindset it’s critical you’re aware of your “default” vocabulary: “I’m rubbish with technology” why not try “I need time and practice to master a new technology” or “I knew I was going to fail” why not try “I’m disappointed it didn’t work out, I will try a different manner next time”. If you don’t do it for you, do it for those around you, particularly young ones. you have a roof over your head, 3 meals a day, clothes and you’re in good health? You’ve got a LOT to be thankful for. I’m not being patronising, just stating the facts. Being aware and grateful for what you have – skills, experience as much as material things – is a powerful tool to help you switch into a more positive mindset. And at work, be thankful for your team, for the great projects you get to work on, no, it’s not perfect but the picture may not be as black as you think. Have aspirations, bold ambitions but never dismiss what you already have. all the above points could only lead to this one, focus on the solution. Being solution-focused demands a positive mindset. You need to be curious, in learning mode, drama-free, resilient and aware of all your skills and abilities in order to get to the best solution. A positive mindset is required to face a challenge and that is the key quality of a great leader. you don’t have to go it alone, all the suggestions I’ve made won’t prevent you from struggling to keep a positive outlook from time to time. Only last week I was faced with a challenge and felt quite defeated, I did all of the above and it helped but I was grateful to my coach and my mastermind colleagues to gather round and offer advice and support. Support can take many forms: accountability partner, circle of friends, mastermind, coach, mentor. Do you prefer 1-1 interaction or group? Quite regular meet-ups or a couple of times a year? In-person or over the phone/skype. You need to think what works best for you. 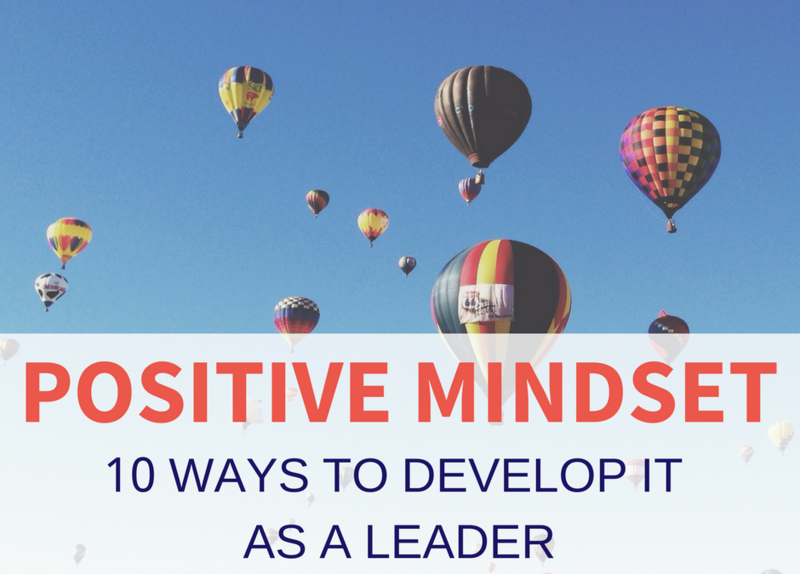 I hope these 10 suggestions give you ideas on how to develop and cultivate a positive mindset in these challenging, but exciting, times. What is your mindset practice? If you want to discuss how to develop a leader’s mindset to impact your career or have questions about this topic, I’d love to carry on the conversation, just schedule a time.